Clean both jars out, and dry them out. Take the outside wrappers off so you will be able to see inside the ant jar. Put the smaller jar, without its lid, upside down, within the bigger jar. Try to center it. Poke a few tiny holes in the jar lid, small enough for ants to not escape. Fill the outside area between both jars, with the sandy-soil. Make sure that the entire area is filled, but don’t pack it tightly or the ants will not be able to dig their way through it. 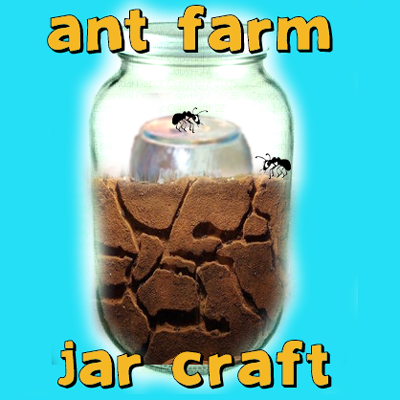 Now you must find the ants for your ant farm jar. Go looking in your back yard or in the local park. If you still can not find any ants then you can build an ant trap. Ants love sugar, so what you should do is put some sugar, mixed with a tiny bit of water, into a jar or can. Put it on its side and keep an eye on it…when you have about 20 ants. 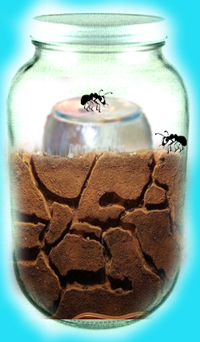 Don’t get more than 20 ants…crowding too many ants in the jar will make them less active and less fun to watch. 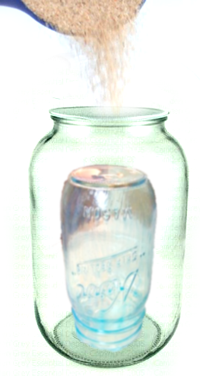 You can close the jar and put them in your ant farm jar (DO THIS OUTSIDE – NOT INSIDE YOUR HOUSE). Important : Make sure that these ants are from the same colony or they will land up fighting and killing each other. Make sure to close that jar tight. Don’t worry about the ants getting enough air because you will be opening it to put food in there. Believe it or not, that is plenty of air for your ants. Once a week (no more than this) feed the ants a few drops of sugar water. You can put it directly into the soil. You can also drop in there a few grains of bird or grass seed. FEEDING ANTS TOO MUCH CAN KILL THEM! – Keep your ant jar away from direct blow of air conditioners, radiators, and heaters…keep them at normal room temperature. – Keep them out of the direct glare of sunlight. Now just watch and observe your ants build their own littler underground city. They can build them most amazing, intricate mazes. I hope you enjoyed this project. Hi, I’ve tried making an ant farm and its going ok. One thing that is troubling me is that every morning there are a few dead ants lying on the top of the soil! This might just be them dying at a natural rate. But it also might be that you got ants from different colonies so they are killing each other. Are you keeping the jar out of direct sun light, also is it away from blasts of air or heat? I think I’m doing everything right but they don’t seem to take in the sugar water I give them. Is there anything else I can give them? Hi Jennifer…check out this article on feeding ants … it will help you a lot. It looks like you can feed them apples, celery, lettuce. This article says you should put a drops of water in every day….so maybe that is what is going on. Thanks that has really helped! I have been feeding them bits of apple and they love them! Sorry but I can not upload a photo at all! By the way how do you tell if your ants are no longer alive? In other words how long does it last? Back when we were teaching, we paid good money for an ant farm. Where was this post back then??? lol…Hopefully, this will make many a frugal parent and teacher smile. We featured your post at our insect unit and craft roundup. Little pieces of apples, lettuce, celery. Sorry that this was confusing. In step #2, yes, take the lid off of the smaller jar. Poke holes in the lid of the bigger jar. And the lid that I want you to screw on tight is for the bigger jar. I hope that this clears things up. so can you use normal sand like beach sand or like play sand?? Also does the sand need to be like damp sand or dry? Or just your garden soil? Yes, just normal, dry, play sand. I hope this helps. Good luck. How long does it take the ants to dig their mazes? why do you put the jar in the middle? What if the ants are all angry? From what I remember, ant colonies need their queen to survive. You can only expect these farms to live for about 1-3 months. Ants communicate with pheromones, I’d wonder if your angry ants aren’t just sending mad pheromones to each other, or perhaps two competing groups. Hi there. I’m sorry that I haven’t responded but my computer was out for repair for 3 weeks. I’m pretty sure potting soil would work, but I’m not sure. Sorry. Can you use a plastic jar? 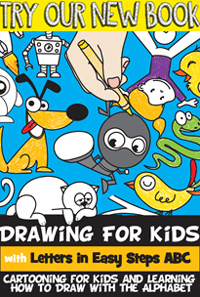 I totally look forward to doing this with my kids! 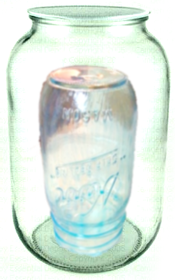 One question though – what is the pupose of the jar in the middle ? I’m wondering…after observing the ants for a while, can you release them back outside again? I’m sure you can…that would be a very nice thing to do.